Public utility areas Best way forward: Please send us your detailed requirement and quantity so that we can quote FOB / CNF prices along with engineering drawings for your approvals. 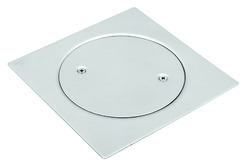 Quality: Each SGE floor drainers is individually inspected and is most durable, hygienic and corrosion resistant. Third party inspection reports can also be made available from raw material stage as per request. 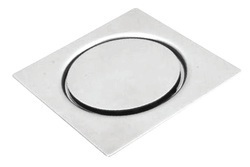 We offer shower drain. These shower drain can be used as balcony drain. Material: Products are available in Stainless Steel AISI 304 (EN 1.4301) / AISI 316 (EN 1.4401 / 1.4404), Chrome plated Brass, Nickel Bronze Sizes: Currently sizes available are 100X100mm, 80X80mm etc. Special sizes can be made as per your requirement.Finishes: Various finishes are available like MATT, MIRROR, and SATIN Fitment: It slips snugly into the drainage pipe and is easy to install. 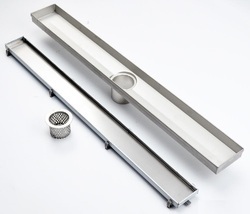 Drainers can be designed to fit various pipes. Designs: Various types of sizes and designs are available. Engineering drawings and details are available on request. We offer cleanout set. Plumbing cleanout is a cleanout fitting with a removable plug that is found in a roughed-in waste system. It is designed to help keep clear any type of debris that could cause any type of stoppage in the water drain lines. Cleanout sets are usually placed at the connection point between the sewer lines and the drain lines where the base is located of a vertical stack, and at all places were the pipe direction changes at about 90 degrees. Material: Products are available in Stainless Steel AISI 304 (EN 1.4301) / AISI 316 (EN 1.4401 / 1.4404), Chrome plated Brass, Nickel Bronze Sizes: Currently sizes available are 200X200mm, 150X150mm 100X100mm, 80X80mm etc. Special sizes can be made as per your requirement.Finishes: Various finishes are available like MATT, MIRROR, and SATIN Fitment: It slips snugly into the drainage pipe and is easy to install. Cleanouts can be designed to fit various pipes. Designs: Various types of sizes and designs are available. Engineering drawings and details are available on request. Threaded cover with keys are available. 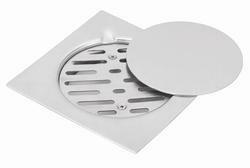 We offer special floor drain. Specialty DRAIN: High end, heavy duty, state of the art floor drains and cleanouts. Material: Products are available in Stainless Steel AISI 304 (EN 1.4301) / AISI 316 (EN 1.4401 / 1.4404) Sizes: Currently sizes available are 200X200mm, 150X150mm 121X121mm Finishes: Various finishes are available like MATT, MIRROR, and SATIN Fitment: It slips snugly into the drainage pipe and is easy to install. Drainers / cleanouts can fit various pipes. Different type of interfaces between pipe and drainers are also available. Hinged type pilferage proof cover and snap-fit grating is available Drawings: Engineering drawings and details are available on request.